In today’s fast-paced world, children juggle more tasks than ever. Learn to Skate USA teaches your kids lessons to sharpen their focus and provide greater balance on and off the ice. As they conquer challenges on their paths to amazing, new worlds well beyond the world of skating will happen right before their eyes. The Learn to Skate Program follows the US Figure Skating guidelines. Our Learn to Skate Program is instructed by certified Learn to Skate Instructors and you can rest assured your child won’t be taught from another child how to skate. The lessons learned in ice skating are also lessons in life. The Learn to Skate – Snowball Tots program provides instruction to preschool skaters ages 3-5. Learning through fun and games, tots are taught the proper way to fall and get up, skate forward and backward, glide and stop; preparing them for more advanced skating skills. Helmets and gloves are required for all skaters. Classes run continuously throughout the year. Registration and contact information can be found at Revolution Ice Centre and online at their website. The Learn to Skate – Basic Skills program provides instruction to skaters ages 4 through adult in the basic skills necessary to ice skate safely, and the initial skills needed before advancing to figure skating or ice hockey. Classes run continuously throughout the year. Group classes are divided into skill levels utilizing the US Figure Skating’s Learn To Skate curriculum. Helmets are required for Tot level skaters and are strongly recommended for all skaters. Gloves or mittens are required for all skaters. Registration and contact information can be found at Revolution Ice Centre and online at their website. The Learn to Skate – Adult Skills program provides instruction to skaters ages 18+ in the basic skills necessary to ice skate safely, and the initial skills needed to skate. Classes run continuously throughout the year. Group classes are divided into skill levels utilizing the US Figure Skating’s Learn To Skate curriculum. Helmets are required. Gloves or mittens are suggested for all skaters. Registration and contact information can be found at Revolution Ice Centre and online at their website. The Learn to Skate – Senior Basic Skills program provides instruction to skaters ages 55+ in the basic skills necessary to ice skate safely, and the initial skills needed to skate. Classes run continuously throughout the year. Group classes are divided into skill levels utilizing the US Figure Skating’s Learn To Skate curriculum. Helmets are required. Gloves or mittens are suggested for all skaters. Registration and contact information can be found at Revolution Ice Centre and online at their website. The Learn to Skate – Home School Basic Skills program provides instruction to skaters ages 5 through 18 in the basic skills necessary to ice skate safely, and the initial skills needed before advancing to figure skating or ice hockey. Classes run continuously throughout the year during the day. Group classes are divided into skill levels utilizing the US Figure Skating’s Learn To Skate curriculum. Helmets are required for Tot level skaters and are strongly recommended for all skaters. Gloves or mittens are required for all skaters. Registration and contact information can be found at Revolution Ice Centre and online at their website. 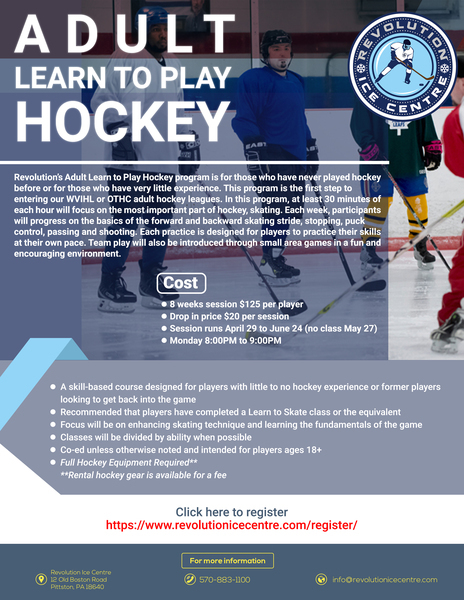 Revolution’s Adult Learn to Play hockey program is for those who have never played hockey before or for those who have very little experience. This program is the first step to entering our WVIHL or OTHC adult hockey leagues. In this program, at least 30 minutes of each hour will focus on the most important part of hockey, skating. Each week, participants will progress on the basics of the forward and backward skating stride, stopping, puck control, passing and shooting. Each practice is designed for players to practice their skills at their own pace. Team play will also be introduced through small area games in a fun and encouraging environment. Revolution’s training camps and clinics are developed to help each player’s skating and skills giving them a better understanding of the game of hockey. At Revolution, we believe that proper instruction, technique and repetition, along with our coaches creative teaching methods, are the key towards each player’s overall development. Our staff is committed to ensuring that all players receive detailed individual instruction during all programs to get the maximum learning experience allowing them to leave our camps feeling positive and confident. Revolution offers this Learn to Play program for youngsters interested in trying hockey. In this popular program, skaters can rent a stick, helmet, gloves, and pants. Skates are required and can be rented from the skate shop. The program focuses on the skills necessary to play ice hockey; skating, shooting, passing, puck handling. Participants must have basic skating skills and preferably gone through the Learn To Skate Program prior to enrolling in Little Revos. Registration and contact information can be found at Revolution Ice Centre and online at their website. This 8 week program is for players ages 7-14. Like Little Revos, it also focuses on the skills necessary to play ice hockey: skating, shooting, passing, puck handling. Equipment is available to rent. Participants need to know how to skate on ice hockey skates and preferably have gone through the Learn To Skate Program in the fall and/or winter to be able to go forward, turn and stop. Revolution offers this Learn to Play program for youngsters interested in trying hockey. In this program, skaters can rent a stick, helmet, gloves, and pants. Skates are required and can be rented from the skate shop. The program focuses on the skills necessary to play ice hockey; skating, shooting, passing, puck handling. Participants must have basic skating skills and preferably gone through the Learn To Skate Program prior to enrolling in Revo’s Homeschool Learn to Play Hockey program. Revolution offers this advanced hockey program for children that are homeschooled. In this program, skaters must have full hockey equipment. The program focuses on the skills necessary to play ice hockey; skating, shooting, passing, puck handling. Participants must have average skating skills prior to enrolling in Revo’s Home School Advanced Hockey program. This program is for families who wish to participate in an ice hockey program without the demands of a heavy travel schedule. Currently, Revolution offers a program for kids 6 to 14. Once a player is fully trained and ready for competition outside our home rink, he or she may try out for a WBS Jr Knights travel team. The Wilkes-Barre/Scranton Junior Knights is a USA Hockey-sanctioned Tier I Junior Youth franchise ranging from mites (Age 6) to peewee (Age 12) led by Head Coach / Director of Knights Hockey, Alex Vasko.